The Last Case. For whole working life people are trying to leave a remark, to make succesful day, week, years spent in the working post. We all want to be recognised by others, respected for the well finished job, promoted when possible. Such example is Ernest, the man who is detective that for his whole life solves all his cases very successfully. These days he is about to retire. But, he won’t go away easily without wining his last case in the career. The task for today is to investigate a theft in a house in his town. Ernest’s great wish is to solve with sucess this case as well. He finds it like this is going to be the crown for him, like all the other few hundred cases are included in this last case. Ernest needs your help today. You, our dear player will have to look for the evidences necessary for the burglars to be cought. Out of 100 percent, Ernest has solved the problems and cases with 90 per cents success. That is great percentage, don’t you think? So, you have a great inspiration to help this smart man. Good luck! 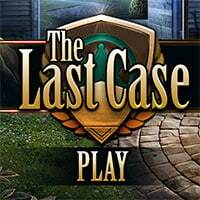 The Last Case is a free online hidden clues game on Hidden4Fun.